I would have posted this yesterday as part of my Happy Birthday Steve fest if not for the fact that I had an internet show to do and was running late. I posted this stuff on Facebook years go but wanted to show them again with more back story. 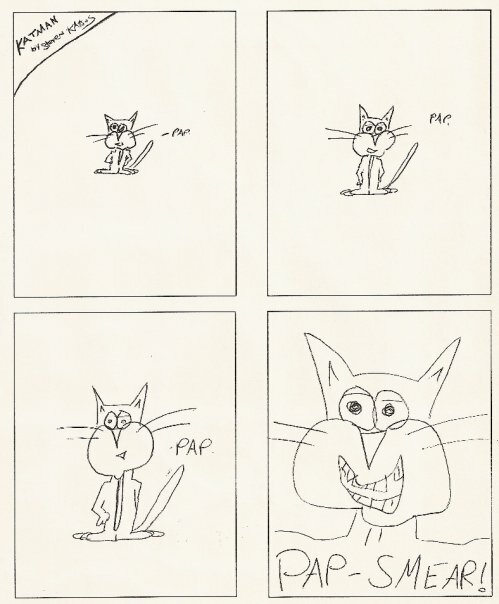 Steve Katsos was best known to me for a long time as just a funny guy and a cartoonist for Framingham State College's student paper The Gatepost. I read and saved his Katman comic, which I thought was hilarious, as it often had cameos by people I know. I made an appearance of sorts early on, but that's a story for later (later meaning when I have time to scan again). 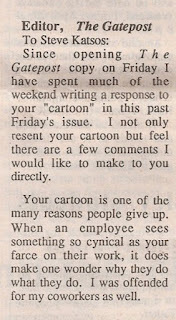 I took over as Comics Editor of The Gatepost (a position so esteemed, I don't think it's existed at the paper for decades) in my Junior year from 93-94. I think after editing his strip in the fall semester, I tried to persuade him to do a shorter strip and tighten things up. He had done an awful lot of stories with Student Government Association officials as villains. I wanted to mix things up a bit. Steve took my bitching in stride and produced, in my opinion, some of his most hilarious work. Of course as an editor, I'm going to claim the stuff he produced under me was amazing. You can read below and judge for yourself. Sorry that you'll have to click on each one individually in order to read them. I'm really sorry about that. The EIC loved the text in the second panel. Cameo by Francisco, the janitor at Towers Hall. CD theft was a big deal at the campus radio station. Steve channels Tim Burton and Frank Miller. The true legacy of the Death of Superman comic is Katman's continuous dying. And yet it wasn't so much these strips but the strip published as kind of an epilogue. I love what Katman writes in panel two for no justifiable reason. The comic above was a crack at the college's Health Center. To the best of my memory, it wasn't even the first joke about the health center. I think for a time it may have ranked just below cafeteria food, late night dorm fire alarm pranks and student parking as a target for jokes. 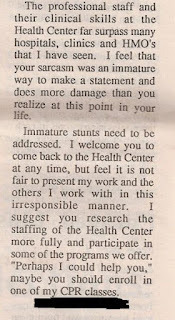 But it's the joke that had the most impact, as the following week, there was a letter from a Health Center official (name withheld here). It's a long letter people. Long and full of outrage. This letter held a veritable buffet of things to Steve to pick and use in his reply, which came out in the same issue the letter was printed in. 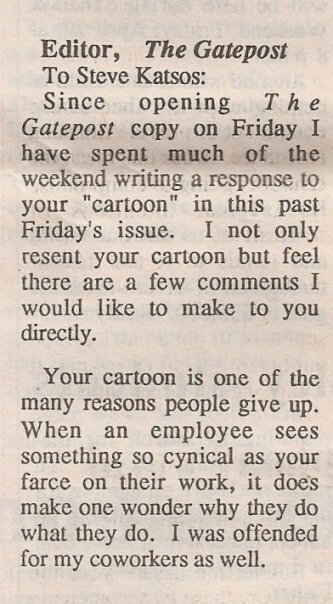 Sometimes there were brief editorial responses, but to have the equivalent of a full letter responding to an angry letter in the same week was all but unheard of. I can only remember Steve being awarded that privilege via the comics pages. Ah, the power of comics. What came next was glorious, and it resulted in an angry one-on-one between me and the newspaper's faculty adviser. 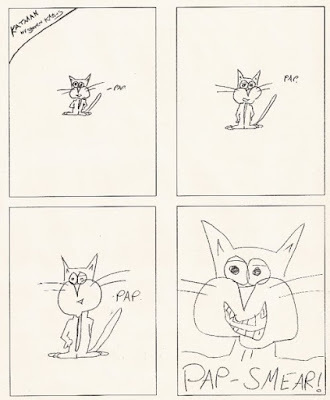 What most people out side of the Gatepost office didn't know was that there was another comic drawn by Steve the following week, which would have been the greatest followup ever. I don't know my exact reasoning for rejecting it. Maybe it was because the issue had died down and people wouldn't understand or get it. Maybe it was because I had a lot of one-on-ones with the newspaper's faculty adviser that year over what I published (maybe that's why there's no comics editor at The Gatepost and no comics page really per se). It was likely a combination of all these things. The strip never ran. But I kept it to show solidarity for Steve. here it is now. Somehow, this could sum up my career in student journalism.